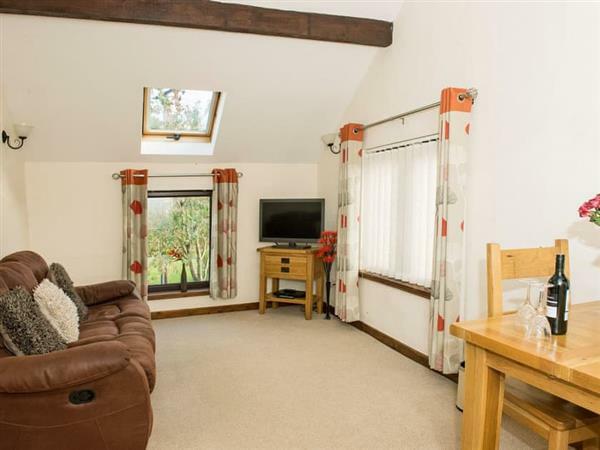 Swallow Cottage at Stonefold Cottages in Newbiggin, near Penrith, Cumbria sleeps 2 people. Stonefold Cottages near Penrith are a couple of holiday cottages at this location. Elevated and looking out onto the beautiful local views of the Lake District National Park, Swallow Cottage offers easy access to not only the north Lake District but also to Eden Valley and Hadrian’s Wall. Located next door to the owner, this semi-detached, ’upside down’ holiday home offers a double bedroom and bathroom on the ground floor, and the kitchen and living room on the first floor. Just 20 minutes from Keswick and 10 minutes from Ullswater, you will be able take advantage of some of the Lake District’s most beautiful lakes and local villages. With walks and bike tracks on the doorstop and shops, restaurants and bars just a short drive away, you will be spoilt for choice with what to do and where to go on your holiday. You will find the shop, pub and restaurant all 3 miles from Stonefold Cottages near Penrith. Swallow Cottage can be booked together with Curlew Cottage (ref UK10698 [Curlew Cottage]) to sleep up to 5 people. Living/dining room: With 22 Freeview TV. Oil central heating, electricity, bed linen, towels and Wi-Fi included. Welcome pack. Enclosed garden with sitting-out area and garden furniture. Private parking for 1 car. No smoking. Holidays at Swallow Cottage, Stonefold Cottages run from Friday to Friday. For a better idea of where Stonefold Cottages - Swallow Cottage is, you can see Stonefold Cottages - Swallow Cottage on the map below. Stonefold Cottages - Swallow Cottage is in Cumbria; should you be on the lookout for a special offer, you can find all the special offers in Cumbria. It's always worth checking to see what is on offer at the moment. Do you want to holiday near Stonefold Cottages - Swallow Cottage (UK10697), you can see other cottages within 25 miles of Stonefold Cottages - Swallow Cottage; have a look to find your perfect holiday location.